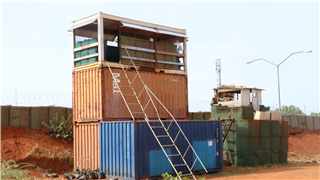 Ten new type watchtowers built by the 8th Chinese peacekeeping engineer detachment to South Sudan (Wau) for were put into use at the camp zone of the peacekeeping forces of the Sector West of the UNMISS in Wau on Tuesday. 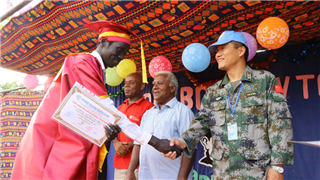 Upon invitation of the Don Bosco Technical Institute, commander of the 8th Chinese peacekeeping engineer detachment to South Sudan (Wau) and representatives of the Chinese engineers attended the commencement ceremony of the institute here on April 6. 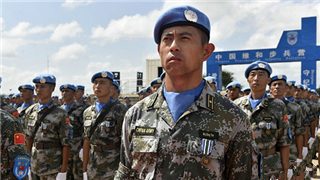 The 410 members of the 16th Chinese peacekeeping force to Lebanon were awarded the United Nations Peace Medal of Honor on Friday, a month before their transfer of authority to the 17th contingent. 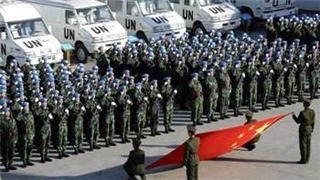 United Nations Secretary-General António Guterres said Thursday that "China is today a very important pillar in our peace-keeping operations." As the annual Tomb-Sweeping Day comes, Cambodian and Chinese officials on Thursday jointly organized a ceremony, paying tribute to two Chinese United Nations peacekeeping soldiers who were killed in a blast here 25 years ago. 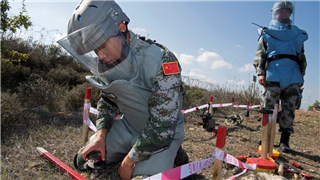 The 16th Chinese peacekeeping detachment to Lebanon recently organized an activity of teaching local children how to prevent landmine injuries. 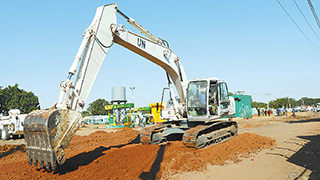 A group of bunkers built by the 5th Chinese peacekeeping engineer detachment to Mali at the Super Camp of the United Nations MINUSMA in Gao passed the acceptance check of the engineering department under the MINUSMA Headquarters on March 29, local time. 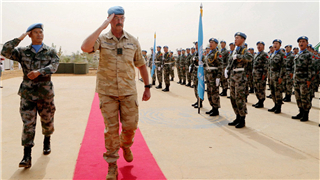 The hybrid peacekeeping mission in Darfur on Monday said a convoy transporting Chinese peacekeepers has arrived in Golo, Jebel Marra. 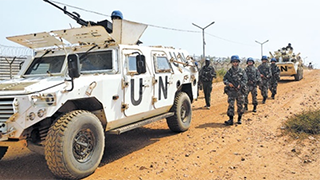 A Chinese envoy said Wednesday that United Nations peacekeeping missions must strictly adhere to UN Charter principles and fully respect the sovereignty of host countries. 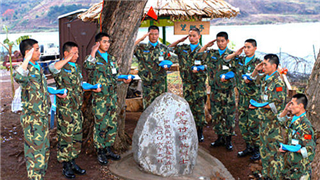 The 5th Chinese peacekeeping guard detachment to Mali officially took over three sentry posts at the Super Camp of Sector East of the MINUSMA from the Bangladesh peacekeeping infantry battalion and the Cambodian peacekeeping explosive ordnance disposal (EOD) company on Mar 20, local time. China's first peacekeeping helicopter detachment to South Sudan successfully completed air transport of troops and equipment of a Rwandan peacekeeping infantry battalion on Saturday. 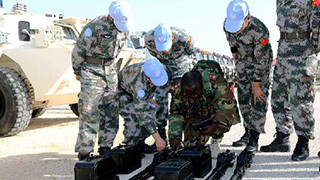 Chinese first peacekeeping helicopter detachment received its first military capability assessment conducted by the African Union-United Nations Mission in Darfur (UNAMID) on Wednesday. 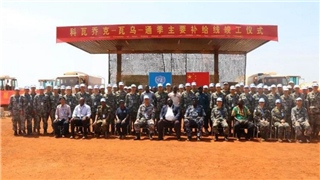 The 8th Chinese peacekeeping engineer detachment to Southern Sudan (Wau) held a ceremony on Tuesday to celebrate the completion of the Kuacjok-Wau-Tonj main-supply route (MSR) maintenance project. 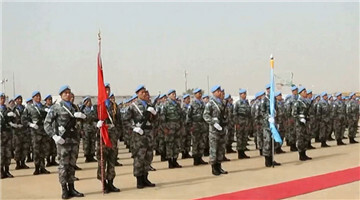 China’s first peacekeeping helicopter detachment concluded the transport of soldiers and cargos of the Senegalese peacekeeping in-fantry battalion affiliated to the Sector North of the African UNAMID on March 4. 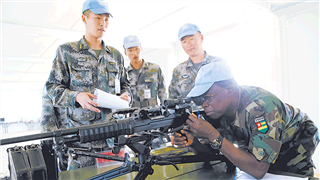 The 8th Chinese peacekeeping medical detachment to South Sudan (Wau) passed the annual Green Camp assessment of the UNMISS on Monday. 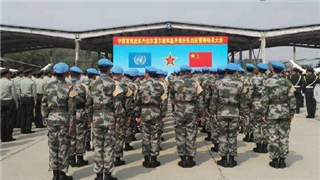 China's first peacekeeping helicopter detachment successfully completed on March 4 the transport of soldiers and materials of the Senegalese peacekeeping infantry battalion affiliated to the Sector North of the UNAMID. 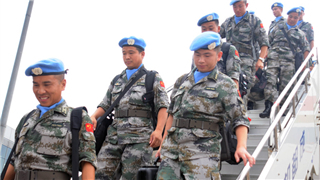 Seven Chinese peacekeepers returned from South Sudan Tuesday after successfully finishing a one-year mission. As China's military looks to reform domestically, it's also expanding its presence abroad. 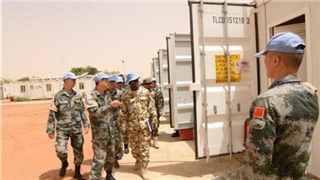 The 5th Chinese peacekeeping guard detachment to Mali successfully passed the third UN equipment inspection on Feb. 24, local time, a confirmation that all its facilities and equipment comply with the UN standards. 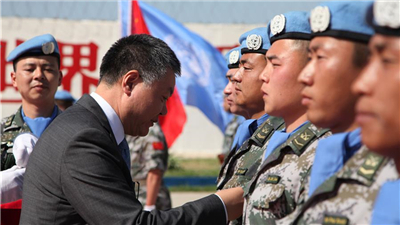 All 395 members of the 5th Chinese peacekeeping force to Mali were awarded the United Nations Peace Medals of Honor by the United Nations Multidimensional Integrated Stabilization Mission in Mali (MINUSMA) on Tuesday. 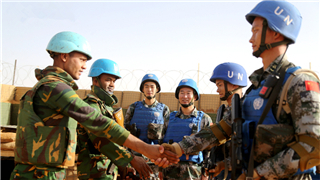 The 14th Chinese peacekeeping engineer detachment to Sudan's Darfur passed its first equipment inspection conducted by the African Union-United Nations Hybrid Operation in Darfur (UNAMID) in late February. 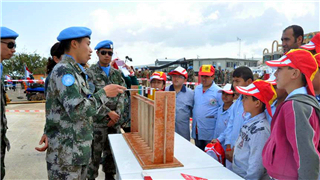 Chinese peacekeepers in the UNIFIL in south Lebanon on Tuesday celebrated the Spring Festival with a cultural and artistic event. 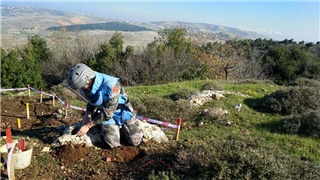 More than 6,000 kilometers away from his home and family, 25-year-old Li Junying waked up at 6 am in southern Lebanon and prepared to search for idle mines scattered along the United Nations Blue Line. 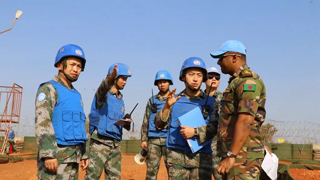 Under the authority of the UNAMID, the 14th Chinese peacekeeping engineer detachment to Sudan recently advanced into the largest conflict-prone area in the region for the first time and successfully completed an 85-km warzone road survey mission in Darfur. 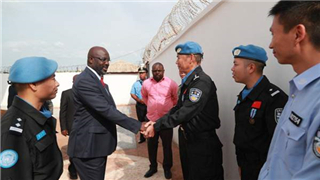 Canada's ambassador to South Sudan, Alan Hamson, lauded the service of Chinese peacekeepers on Friday, after meeting them on an inspection tour to a South Sudanese town. 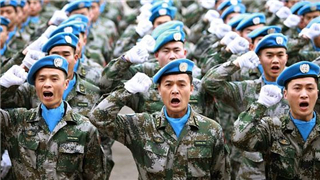 The 8th Chinese peacekeeping engineer detachment to South Sudan (Wau) passed the peacekeeping capability assessment of the United Nations Mission in South Sudan (UNMISS) on the first day of February. 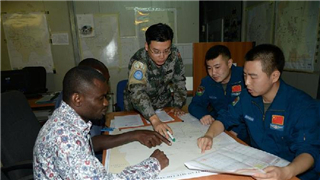 PLA's high-definition telemedicine application system is available at the Chinese peacekeeping Level-II hospitals in Mali, Lebanon, Congo(K), S. Sudan, and the peacekeeping infantry battalion to S. Sudan. 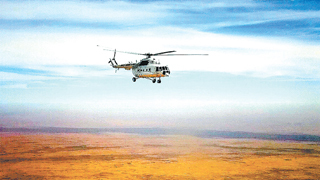 China's first peacekeeping helicopter detachment to Sudan received and passed the combat readiness inspection conducted by the African Union/United Nations Hybrid Operation in Darfur (UNAMID) on Jan 22. 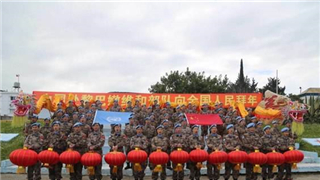 The United Nations (UN) conducted an equipment inspection to the 16th Chinese peacekeeping multifunctional engineer detachment to Lebanon on Jan. 22, 2018. 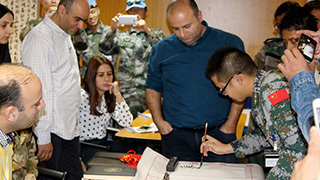 The commencement ceremony for the first Chinese language training course for peacekeepers and employees of the UNIFIL was held at the UNIFIL training center on January 23, 2018. 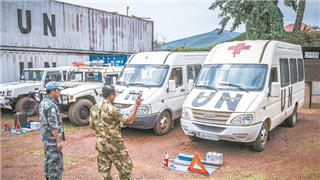 The 21st Chinese peacekeeping medical detachment to Congo (K) recently passed the equipment, ammunition and wartime effectiveness of the COE examination by an inspection team of the United Nations Organization Stabilization Mission in the Democratic Republic of the Congo from Jan 16 to 18, 2018. 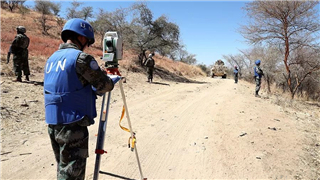 Three roads in downtown Ed Daein, capital city of Sudan's East Darfur State, repaired by the 14th Chinese peacekeeping engineer detachment, were opened to traffic on Jan. 15, local time. 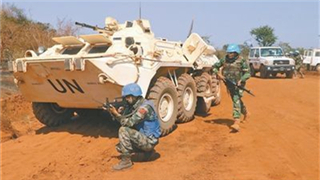 The 8th Chinese peacekeeping engineer detachment to South Sudan (Wau) and the Bangladesh peacekeeping infantry battalion conducted a joint defense drill on Monday to enhance the capability of jointly dealing with emergencies. 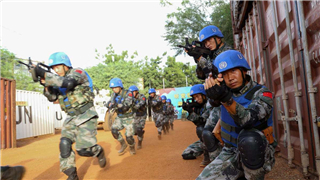 "I am not afraid to face the muzzle because we are here to protect the land," said Yang Yongqiang, a platoon leader of the 3rd Infantry Company of the 4th Chinese peacekeeping infantry battalion to South Sudan, upon recalling the incident that happened a day ago. 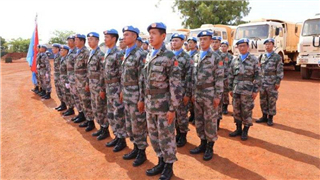 The 5th Chinese peacekeeping guard detachment in Mali received from 14th to 19th of December a systematic evaluation conducted by an team consisting of 18 staff officers from the United Nations Multidimensional Integrated Stabilization Mission in Mali (MINUSMA) Force. 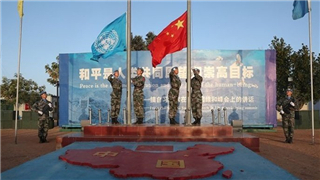 A UN charter plane carrying 109 Chinese peacekeepers departed from the Wusu International Airport in Taiyuan, capital city of Shanxi province, for Sudan at about 3:00 a.m. on Tuesday morning. 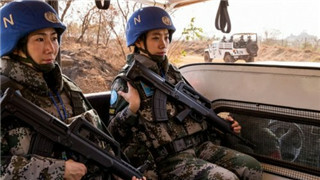 The incident reportedly occurred at the same location where two Chinese peacekeepers were killed during fighting in South Sudan 18 months ago. 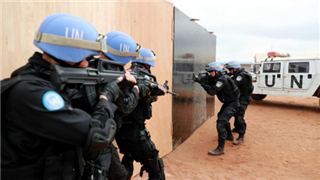 The 5th Chinese peacekeeping engineer detachment to Mali carried out a joint defense drill with the Nigerien peacekeeping infantry battalion in Ménaka on Sunday morning, in a bid to jointly enhance the capabilities to deal with emergencies under harsh security situation in Mali.